IFNGR1 (E444) Antibody recognizes endogenous levels of total IFNGR1 protein. Polyclonal antibodies are produced by immunizing animals with a synthetic peptide corresponding to residues surrounding Glu444 of human IFNGR1 protein. Antibodies are purified by protein A and peptide affinity chromatography. Western blot analysis of extracts from various cell lines with IFNGR1 (E444) Antibody (upper) or β-Actin (D6A8) Rabbit mAb #8457 (lower). 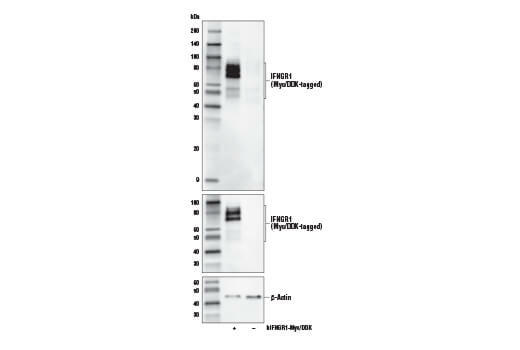 Western blot analysis of extracts from 293T cells, mock transfected (-) or transfected with a construct expressing Myc/DDK-tagged full-length human IFNGR1 protein (hIFNGR1-Myc/DDK; +), using IFNGR1 (E444) Antibody (upper), Myc-Tag (71D10) Rabbit mAb #2278 (middle), and β-Actin (D6A8) Rabbit mAb #8457 (lower). Immunoprecipitation of IFNGR1 from NCI-H226 cell extracts. 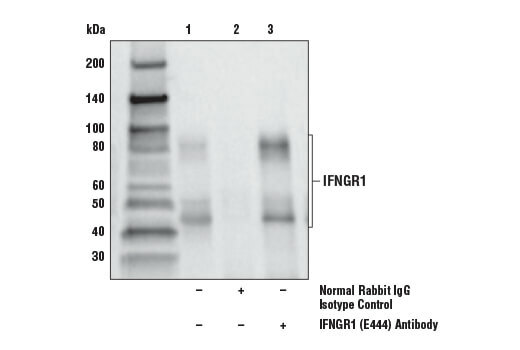 Lane 1 is 10% input, lane 2 is Normal Rabbit IgG #2729, and lane 3 is IFNGR1 (E444) Antibody. 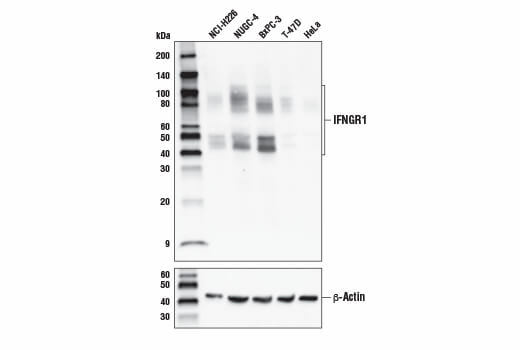 Western blot analysis was performed using IFNGR1 (E444) Antibody. Mouse Anti-rabbit IgG (Conformation Specific) (L27A9) mAb #3678 was used for detection. IFN-γ plays key roles in both the innate and adaptive immune response. IFN-γ activates the cytotoxic activity of innate immune cells, such as macrophages and NK cells (1,2). IFN-γ production by NK cells and antigen presenting cells (APCs) promotes cell-mediated adaptive immunity by inducing IFN-γ production by T lymphocytes, increasing class I and class II MHC expression, and enhancing peptide antigen presentation (1). The anti-viral activity of IFN-γ is due to its induction of PKR and other regulatory proteins. Binding of IFN-γ to the IFNGR1/IFNGR2 complex promotes dimerization of the receptor complexes to form the (IFNGR1/IFNGR2)2 -IFN-γ dimer. Binding induces a conformational change in receptor intracellular domains and signaling involves Jak1, Jak2, and Stat1 (3). The critical role of IFN-γ in amplification of immune surveillance and function is supported by increased susceptibility to pathogen infection by IFN-γ or IFNGR knockout mice and in humans with inactivating mutations in IFNGR1 or IFNGR2. IFN-γ also appears to have a role in atherosclerosis (4). Schroder, K. et al. (2004) J Leukoc Biol 75, 163-89. Martinez, F.O. et al. (2009) Annu Rev Immunol 27, 451-83. Kotenko, S.V. et al. (1995) J Biol Chem 270, 20915-21. McLaren, J.E. and Ramji, D.P. (2009) Cytokine Growth Factor Rev 20, 125-35.